SAGITA COM - Storyboard Pro 3D SP1 Full adalah perangkat lunak yang mampu melakukan grafik 3D, selain itu software ini menyediakan fungsi tambahan, termasuk penambahan Fly Kamera 3D. 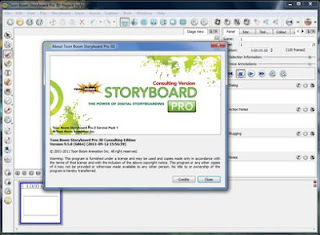 Storyboard Pro 3D menambahkan kemampuan untuk mengimpor objek 3D CGI memungkinkan Anda bekerja artistik dan menyederhanakan alur kerja Anda. Apakah Anda bekerja di 2D, 3D, aksi live-, game, atau media campuran, Anda akan melihat manfaat nyata dari storyboard dalam ruang 3D. Ability to rotate around the Stage view in full perspective mode. Enable 3D mode that allows 2D layers to be rotated and repositioned in 3D space. Enable 3D mode that allows the Camera to be rotated and repositioned in all axes. Export Soundtrack as a WAV. Face Camera mode for 2D layers to always face the camera. Look At Selected functionality to easily snap the Stage View to a drawing layer to draw. Open a library that contains 3D files for easy import into the project. Reset to 2D mode to remove all 3D manipulations. Import with textures visible in OpenGL. Manipulate imported objects in 3D. Subselect meshes in the 3D object to manipulate them based on the pivot points that were set up in the original 3D file. Reposition pivot points in Storyboard Pro 3D after import. Choose between Wireframe, Flat, or Shaded display for 3D objects. Efficient visualization of your ideas. Windows Xp/ Vista/ 7/ 8 (32 & 64 bit).